Growing up in rural Wisconsin, you notice some differences once you visit the big city of Madison: constant traffic, large crowds, and food carts. They’re everywhere downtown, especially on the capital square. The hustle and bustle of a bigger city helps food carts thrive, since speedy food and convenience are a necessity to eat during a busy schedule. I was hungry and curious, so I decided to check out Food Cart Night at the Henry Vilas Zoo. I don’t remember the name of the food cart I chose, but I know it served excellent Mexican food. The taco I had was amazing, and the menu was pretty lengthy given the limited space the food cart had. The park was packed that warm summer Tuesday, and the demand for food cart goodies was impressive. There was a line of people waiting, but an order came out every couple minutes or so—except for mine. The cashier lost about five orders and backed up the entire process, with my taco in the middle of that screw-up. It took the workers about 20 minutes to figure out they were missing orders, and another 10 or so to finally get my food done properly. I didn’t want to wait over 30 minutes for a taco, but I couldn’t exactly leave; I was trapped. My experience might not have been the average food cart meal, but it did make me wonder if there was a faster way to get service. The expected target market for food carts are people on the go who need speed and convenience, so maybe businesses could speed things up with an app? Given the success of last month’s survey on restaurant app expectations, IH Concepts decided to conduct one about food cart apps as well. We weren’t sure how people would respond to the experimental concept, but I thought there might be some questions worth asking. From our survey of 32 adults, we found that a majority (87%) had eaten at Madison food carts before, but most of them (93%) had never used a food cart app. Apparently I had been a part of a small group that hadn’t eaten at one before, but I’m glad I finally experienced it. I was glad to see, however, that survey takers agreed with me about my extreme wait time. When asked how long they’d be willing to wait for food from a food cart, less than 10% of survey takers said they’d wait longer than 10 minutes. This shows that speed is necessary for a food cart to keep customers happy. Having a menu on an app isn’t optional anymore, and given the mobility of food carts, location is necessary too. Our survey results showed a higher desire for online ordering than I expected there would be, and that’s a good thing. Currently, I don’t know of any food carts that offer online orders, so this shows a need for a service that isn’t available yet. If you want to engage customers, it’s important to listen to their ideas and meet their needs. Within Madison, where the food carts thrive, a lot of people live a life constantly on the move. To meet their extremely busy schedules, their suggestions like “live tracking”, “online payment”, and “schedule” would be very helpful. That way customers could go directly to your business (if you’re a business owner) instead of spending time searching and potentially going somewhere else. If food carts want to keep up with the expectations of our current society, it might be time to upgrade to having their own apps. 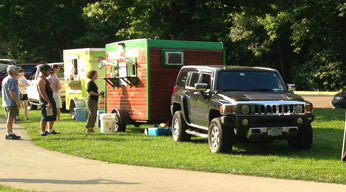 Most food carts do have a social media presence or a website, but that information can be hard to track down. An app, however, could easily display all of the information that our survey takers are looking for with the ease of a mobile-friendly design. There is always a need for fast and convenient food. Providing customers with a tool that conveniently reduces wait time could meet this need, and could start a new trend for food carts apps. Think about the audience for food carts: on the go people who are on their phones constantly. An app could drive traffic to the business and start some word-of-mouth advertising when people discuss it, the first food cart app. Your marketing strategy should adapt to reach your target market.